Annual Dinner is July 21! Every organization has times of conflict, troubles, and turmoil, and during the last five months, we sure have had ours. Since February, two directors were recalled and nearly suspended; one eventually resigned from the association, and the other is now noncommunicative about association paperwork he still has. Our Permit with the City is up for renewal, yet rumors abound that we will not get that renewal. After 15 years of relatively automatic Permit renewals, Linda Barth this time insists we go through a full proposal process; at the same time she admits that once the City reviews our proposal, it may decide that the City has the expertise and staff to do Operations, to restore M.177, etc., as their own City-led projects. Track projects are almost assuredly out of the question, even if we do have our Permit renewed. We expected to build and operate M.177 on the Zoo Railroad, but I must admit that our future at Travel Town does not look bright. All these troubles started awhile back, but like most groups, we chose not to air our problems in our newsletter. Instead we worked behind the scenes to try to find solutions. But with our impending Permit renewal in question, it’s time for associates to hear the details of what has been going on with the SCSRA and Travel Town. Readers may have picked up on some of the troubles we’ve had, how we’ve been reporting for months and months that we are very close to getting track work approved, and yet none has been approved. This has been especially nerve-wracking since the City is gearing up for the Locomotive Pavilion construction, and some of the track work we proposed needs to be done before Train Shed work begins. Gordon resigning as chairman surprised some, since he has been chairman of the SCSRA board for as long as I can remember. By Gordon resigning and the board electing Bryan Reese chairman it was hoped that Bryan could break the logjam with our stalled track projects and other issues which we wanted Linda to address. Those who come to the park regularly know of the most recent flare-ups which led to the recall of two of our board directors, Bryan Reese and Greg Ramsey. Bryan has now resigned from the association altogether. Greg has lapsed his dues and refuses to answer e-mail from me for several weeks now. Many people are upset at all of this. To explain what happened, I must start back in early last year, when I received e-mail from Greg Gneier appointing Bryan Reese “Safety Officer” of the Zoo Railroad. Nancy Gneier had just nominated Bryan for SCSRA Safety Officer the previous weekend, and I agreed he was a great choice but told Nancy that I’d like to consult with a few people first. Then Monday I got Greg’s e-mail and thought that the announcement was premature, since I hadn’t agreed to anything, and the president appoints all officers. In the midst of some confused e-mail that then began circulating, Linda Barth announced that Greg Gneier was project manager of the Zoo Railroad, and the Zoo Railroad was a City project. Therefore Greg could appoint whomever he pleased, without any approval from SCSRA. SCSRA leadership was taken aback by this announcement. You mean the Zoo Railroad is not an SCSRA project? Aren’t we building the Zoo Railroad, we said? But Linda was adamant, and we soon learned that, even though Greg was appointed Zoo RR Project Manager by joint appointment from SCSRA and ASRA a year or two before, SCSRA had no power to unappoint him. He was now under the City’s mantle, and we could do nothing about it, Linda said. Gordon promptly called a special board meeting to find out what was going on. We were “partners” with the City, we always thought. Had something changed? But at the special board meeting in February 2000, Linda refused to attend. She faxed in a letter which said, among other things, that if the SCSRA wanted answers from her, the association president (me) had to draft a letter to her, and she would then answer the questions posed in the letter. So I gathered all our questions and sent out a letter. I received a response that never really answered any of our questions. This upset many people, board members and officers alike. At the time, I must confess that while I sympathized with those who were upset, I thought we just had a little misunderstanding. So I offered to personally meet with Linda. I planned to take all our grievances, which included some personality conflicts that had arisen between our M/W Foreman, Dan Price, and Greg Gneier. To make sure I really knew what was happening, I called each person who worked track and asked them their opinion of what was the problem. I wanted to make sure I knew what I was talking about. At this meeting with Linda, I broached all the contentious topics that the associates had expressed to me: were we not going to build the Zoo RR? Linda showed me that our Permit only had a small half-sentence that mentions track work. Some associates wondered aloud whether Linda should have a voting seat on our board since she did not pay association dues. Was this a conflict of interest, I asked her. I felt uncomfortable mentioning this, and insisted that if she felt it was not a conflict of interest, not to worry about it, but I had to ask these associate questions (later when she resigned from the board, she claimed that I recommended she resign). I mentioned the problems between Dan and Greg, and said that I can invoke our code of conduct with Dan and guarantee that he will act accordingly, but can she do the same with Greg? Technically our code had no effect on Greg, since she claims he is not working under our auspices. Surprisingly she offered to remove him as Zoo Project Manager if I would write a written request. I was unsure if we needed to go that far, but after she offered this several times, I said OK, I would go back and discuss that option with the board. I asked specifically if we could have in our upcoming new Permit (since our current one expired at the end of 2000) some provision for us to be designated the builders of the Zoo Railroad. At about that point in the discussion, Linda said a very curious thing. She said that the SCSRA needs to decide for itself what it wants to do, apart from Travel Town. I wasn’t sure what she meant, and finally said I was here to discuss the Permit, which involved what we were allowed to do at Travel Town, so why would we discuss things we might want to do at any other location? I left the meeting with many things to tell the board, such as Linda’s insistence that our financial reporting be cleaned up, so we could submit grant proposals for M.177. Many of her criticisms I had to agree with, and I left hoping that if SCSRA got its books in order, and Linda would approve a track plan for Tail Track and Track 7, we’d be back working and happy once again. In the spring, Joe Barilari proposed track work for Tail Track and Track 7. You may recall that Joe built a ½-size train ride in Acapulco, one that ran over bridges and manmade lakes. Joe could not attend Saturday work days and proposed to come in during the week and make work plans for a weekend crew. Linda wanted supervision on the weekend, though, so she rejected his plan. I then asked Gordon to agree to be the weekend superintendent, which Linda was receptive to, and so we again resubmitted that proposal, adding a work schedule. We waited for word on it through August. Finally in September, the plan was again rejected. By that time we enlisted Bryan’s help as the new chairman to see if he could improve relations with Linda. She was not communicating very promptly about these plans and our workers were getting demoralized. Bryan joined the cause with really good ideas for solving some long-standing issues, like how the City now takes in donations at the gate. People were telling our docents as they pass our donation boxes on Operations days, “I already gave at the gate,” and our associates felt that our donation collection was suffering because of that. Bryan suggested that he could maybe get Linda to cover over the donation boxes on Operating weekend, kind of a “good faith” gesture. So we were all hopeful that Bryan could do what we could not: get some concessions from the City. He did eventually get a promise from Linda that she would reimburse four people getting operator certification to run the skip loader (now a City requirement). But while Bryan would verbally say Linda was receptive to his ideas, he never got anything definitive in e-mail or by letter from her. We Seem at an Impasse, What to Do? Meanwhile, after months of having our track plans languish, Gordon wrote a letter to Ellen Oppenheim of the Dept. of Rec/Parks, confiding to her that he was ready to “de-volunteer” since in his opinion the SCSRA was no longer being treated as a partner at Travel Town. By September, he was contacted about his complaint and he referred the person given charge of investigating our problem, Margie Matthews, to me as SCSRA president. I met with Margie and summarized how track work was stalled, how on several occasions Linda seemed to try to stir up trouble, and I brought e-mail and other documentation to show her what I meant. Margie was genuinely sympathetic to our situation. At the end of the meeting, however, I suggested that no action was needed at this point, since I still had hopes she could approve Joe’s plan (still pending). I wanted Linda to work with us, if possible, and an official complaint would just make things worse. Margie agreed that it was best that Linda not be alerted to our complaint. After Joe’s plan was officially rejected, Bryan encouraged Dan Price to take a crack at his own track plan, which Dan submitted in early November. Dan’s proposal truly looked impressive, and early feedback we got from Linda via Bryan was that it just lacked a materials list and a schedule. Since Dan had just started college, he did not get to providing these until Christmas vacation, but by the end of December he submitted the requested documents. At about that time, I agreed to meet Linda and Bryan for a meeting in which Bryan claimed I’d see real progress in our efforts. Bryan said Linda truly intended that we become operators of the Zoo RR, and that we could ask her about covering over the donation boxes, etc. Unfortunately the meeting didn’t go quite like that. Linda did not clearly say she would work the SCSRA being operators of the Zoo RR into the Permit, as Bryan hinted, or agree to covering over the donation boxes. In fact, she said she could not agree to cover over their boxes since she did not know where our Operations donations went. I felt this implied we weren’t being honest. She insisted that since our new treasurer still had not produced a good copy of our recent financial documentation, she could not allow the City to seem to promote donations to SCSRA in lieu of Travel Town. She did offer to have an “M.177 Day” where she would cover over her boxes, if we agreed that all monies would go to M.177. I was unsure if we could do that, considering that Operations may fund some other departments’ budgets, and said I’d check on that possibility. But I was especially dismayed when Linda told me that after she got Dan’s materials list and schedule for the track work, she would then need an implementation plan. Why hadn’t she said that months before? I felt depressed about the meeting, and a few days later I expressed my disappointment to Bryan. This began a real breakdown in my relationship with Bryan. He was absolutely incensed that I was so negative about Linda’s responses. A few weeks later he wrote me a letter in which he told me I was unfit to deal with Linda, because of my “bad attitude.” He made two demands: I must appoint Greg Ramsey head of M/W (he said Greg had a track 7 plan that Linda would “definitely approve”), and I forgo any further contact with Linda, allowing him alone to do the association’s dealings with her. He said if I did not do as he asked, he would walk away from the M.177 and leave the association. I contacted Bryan and said I could not agree to this. First of all, Greg Ramsey was having his own problems with SCSRA. Greg had just been reprimanded for moving blue flagged equipment. Before that, his behavior as operator with his wife as brakeman, making her react very abruptly to some of his hand signals for no good reason, caused an operating bulletin to be issued which now forbids blood- and marriage-related people supervising one another. Greg was also under investigation for moving Charley with no ground crew the previous July during Friday Training. This was not the person I felt I could appoint to a new superintendency. Indeed, Gordon had just relieved him of his assistant mechanical superintendent position a few weeks before. I explained all this to Bryan, and then added that he had no business saying that I was not fit to deal with Linda. I always conducted myself courteously and professionally, but I shouldn’t have to pretend to him that I was happy about how our meeting went. I was able to convince him not to resign by agreeing that he could lead our Permit Committee. He said he was still going to take a break from the M.177, but he would not leave the association. While all this was happening, Dan and I were waiting on Linda’s final OK of his track plan. She asked us to meet with her on a Saturday in January, but then we didn’t hear anything. Finally I asked her what was happening, and she replied that she sent me a letter about it. The next day I got the letter. She rejected Dan’s plan, citing that it was not peer reviewed. This seemed like the last straw, but Dan and I quickly got it reviewed. I read it carefully myself this time, and suggested some changes and justifications to make it completely clear why Dan had this or that in the plan. I was still in contact with Margie Matthews, but even at this late date, I was still hoping we could work things out ourselves, without any City intervention. Then really crazy things started to happen. While I was out of town in early February to see my ailing father, Bryan called an “all-hands” meeting and told the usual Saturday work crews that he was leading Track 7 work, the work that Dan’s plan covered. He also told everyone that Gordon and I had gone over Linda’s head and complained about her, and she had lost a job promotion because of it. Apparently he learned of my conversations with Margie Matthews, and got her and Linda’s boss, Tony Coroalles, to believe that Gordon and I had done this all on our own because we had some personal grudge against Linda. He also told this meeting that Gordon and I would be thrown off the board because this violated the code of conduct, and lobbied other board members there for their support. What Bryan did not know is, all the other board members except Greg and him did know about my communications with Margie. We could not tell Bryan and Greg about it since we knew they would have told Linda and ruined any chance we had of working things out ourselves. Soon after I got back, two directors called a special board meeting to recall Greg and Bryan as directors. They argued that, among other things, Bryan had misrepresented himself to Margie and Linda’s boss in saying that the board had no problems with Linda. Greg appeared to be acting in support of Bryan in submitting his track plan while Dan’s plan was still under consideration, and his code of conduct and safety violations were also cited in his recall. I personally thought Bryan leading Track 7 was a great idea, but wished he had told me he was willing to do that. I was also of course not happy that he had maligned me in public. But I wanted to salvage the situation by figuring out a way to get the track department to back Bryan leading their project, with the plan that Greg Ramsey had done which Bryan said Linda liked. Call me crazy, but I still hoped we could patch things up during the 30-day delay before the recall vote. The board had appointed Dan’s four-man M/W Committee as official Maintenance of Way superintendents, so I told them that they needed to decide whether to accept or reject Bryan’s leadership on Track 7. After deliberating, they elected him project manager. Jeff Barrow called and offered him the position. Bryan refused it. He later called me and said he would only lead Track 7 if Gordon and I resigned from the board, and I resigned as president. It was too much to ask. I had already bent over backward to set up things as he wished, and get everyone necessary to back him officially, but I had reached my limit. Bryan continued to periodically insult me via e-mail all through the 30-day cooling off period our bylaws provide after a move to recall. Greg’s e-mail list was used as the forum for most of the attacks. Both Bryan and Greg asked me why specifically they were being recalled, and I e-mailed them the reasons as I saw it. Neither acknowledged any truth to the allegations but they also never submitted a rebuttal statement, nor did they attend the recall meeting. So when the recall votes were counted, Bryan and Greg were removed. Some directors were angry enough that suspension and even expulsion were debated, but others at the meeting argued that recall was enough punishment, so a vote on suspension was delayed and later tabled. For a long time I could not understand why Bryan and Greg so vehemently refused to reconcile with us. I called, mailed, and e-mailed both of them, trying to get them to work with me so that they did not break away from the association. It was to no avail. I thought back repeatedly, what went so wrong? Was it so wrong that Gordon and I were concerned about the needed track work, and concerned about the distancing we were perceiving from Linda, to want to inquire about it to her superiors? It didn’t seem so wrong to Ellen Oppenheim or Margie Matthews, since Margie talked to me for months, asking to be kept informed all that time. Are we to fear talking to someone’s supervisor, especially a City employee’s? Yet Bryan and Nancy Gneier have both told me, “You better do just what Linda says! She can take away your Permit!” To which I said, “Not if we haven’t done anything wrong!” And I did not feel we had done anything wrong. Margie even told me that Linda did not lose any promotion due to our conversations with her, contrary to Bryan’s allegation. While I recognized that this was the same thing she said way back in April 2000, it wasn’t until after she repeated it yet again at the Permit meeting that I began to realize its possible significance. Could this mean that Linda was very likely, even early last year, planning to phase out the SCSRA’s involvement at Travel Town, long before Gordon mailed Ellen Oppenheim, long before I talked to Margie Matthews, long before we submitted any of the track plans we worked so hard to get approved for over a year now? And if that’s true, why would she want to do that? Whatever the reason, it’s a reason that couldn’t have anything to do with City upper management (since they did not seem to know about it and were investigating it for months); it has nothing to do with Linda’s immediate superior (he was hired at Christmastime, long after this strange tension between SCSRA and Linda began). I don’t know what would lead her to want SCSRA out of the picture. Nevertheless, we put together and submitted an exceptional Permit renewal package that ran 38 pages and included two years of balanced quarterly financial reports. The files are on the web at http://www.scsra.org/permit/. Linda is due to respond in early June, and we’ll see if SCSRA will continue to provide monthly Operations, and/or will continue to fund and staff the restoration of M.177 and maintain the City’s two diesel locomotives. I’m hoping that our 15 years of service, our perfect Operations safety record, our willingness to work and donate time and money, and all our progress to date will mean something to the City of Los Angeles and the Department of Recreation and Parks. We have tough competition, though. Since Bryan Reese has left the association, he has told many people that he will be taking over restoration of M.177, volunteering directly to the City. He also has told our associates that the City will “accept” our operator qualifications to participate in a City-run Operations. Nancy Gneier is reported to have told people with Union Pacific that she is in charge of building the Zoo Railroad. And Greg Ramsey, holding our association’s acquisitions paperwork, will likely seek a direct-to-City volunteer position of authority. May I remind you now, how earlier in this admittedly long tale, Linda told us that the Zoo Railroad was a City-led project, with Greg Gneier reporting directly to her? For many, all this seems like the end of the world, the possibility of not getting our Permit renewed, of having to leave Travel Town with the M.177 unfinished. Well, this article is long enough, but I’ll just say we have found several other opportunities for train activities. I’ll explain more at the dinner (July 21 is the new date; make sure you RSVP by June 15), and more in the next Headlight, but as they say, “Seek and ye shall find.” We have found plenty to be excited about in additional venues where we can at least spread out, and really be the SOUTHERN CALIFORNIA Scenic Railway Association. If we get our new Permit, we can continue with Operations, M.177 restoration, and locomotive maintenance. But at the same time, we shall do track work elsewhere, I promise you. We already have sites to visit and some are proving to be quite promising. But I have run on longer than any other person in Headlight history, and so I leave those details for another time. SCSRA President Sue Kientz summarizes the events of the last month at an all-hands meeting at Travel Town. Attending are (from left on bench) Bryan Reese, Charity Lawrence, Mike Vitale, Andy Evans, Gordon Bachlund, Ed Temm, and Tim Riley. Other associates who attended included Jeff Barrow, Nancy Gneier, Alan Weeks, and Annette Sevigny. See all photos. When asked whether the SCSRA was being moved out of Travel Town as many heard rumored, Sue had this to say: Linda had asked her to convene a Permit Committee to meet with her later in April, and Sue felt this was a promising sign, that the City wanted SCSRA to renew its Permit. Otherwise why would she be asked to form a committee to meet with Linda? Linda Barth also attended and took notes during the meeting (in white sweater). Some associates like Darlene Sexton (far left) had questions that were best answered by Linda, such as why aren’t we implementing the Track 7 plan that Bryan told everyone about. Linda said she was really not prepared to talk at this meeting and was just here to listen. She did say there were problems with the leadership of Track 7, and we later learned that she is planning for other options to finish Track 7. 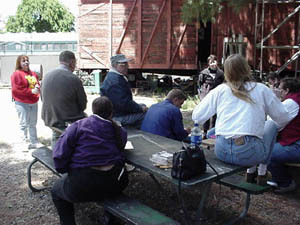 For example, a contractor came out and “straightened the lead” on Track 3, paid for by the Travel Town Museum Foundation. Thanks to Dan Price for the photos. The year 1954 was a dramatic year for The Little Ranger and its crew. Early in the year, Wednesday, February 11, at 1:45 p.m. to be exact, a car was struck and extensively damaged. The accident occurred at Gordy and Ash railroad crossing. The driver, Perry Henman, a 47-year-old El Dorado man, escaped injury as he attempted to drive along the right side of the tracks but discovered there was not enough room, so he tried to hurry on across the tracks but failed to make it in time to avoid the slowly approaching engine. Later the same year The Little Ranger struck a car at a grade crossing in Cassoday, Saturday, June 12, killing the lone occupant, 72-year-old Josephus Milbourn Reed. Reed, a retired hardware merchant, banker, and farmer, had lived in Cassoday for more than 40 years. Did the little train’s new schedule that went into effect January 9, 1954, tend to get people mixed up, as to when to expect its appearance? Jim Bowyer, local Santa Fe agent, announced the Little Ranger’s northeast run to Emporia would leave El Dorado at 3:49 p.m. instead of 5:35, due to the big Ranger’s schedule change on the main line. The Little Ranger’s engineer, Roy Crandall, made two nine-year-old El Dorado girls very happy in November 1946. Dorene Church and Phyllis McMilliam shared November birthdays and had a giant birthday wish that year — they wanted to take a train ride. Their parents and the “Railroad Santa” made arrangements and Roy Crandall took them with him in the engine to Winfield, his hometown. On their arrival they were met by Mrs. Crandall and her sister, who was a correspondent of the Winfield Daily Courier. They were thrilled when their picture was published in the Winfield paper. Then they enjoyed a fried chicken dinner topped off with a big birthday cake at the Crandall home before the return trip to El Dorado. Dorene cleared up a question about how the motorcar came into El Dorado on the spur. She remembered when the train was headed for Winfield, it backed up to the El Dorado station and Mr. Crandall would be on the west side of the engine. On the return trip the children knew they would have to be on east side of the tracks when he threw out his sweet treats. Roy Crandall began buying treats for the El Dorado children in 1945 when the motor service was inaugurated. Dorene said Santa Fe made Mr. Crandall quit throwing the treats along the railroad because of safety reasons. Not wanting to disappoint his many friends he continued sharing with the children only at the station until he was transferred to the Emporia/Concordia route in April 1948. Roy spoke of The Little Ranger as “the little monster of the rails.” When he died the girls’ parents took them to Winfield for his funeral. The Little Ranger brought more sadness to Dorene. When her brother, Thomas Vernon, was killed in battle in 1945 during World War II, The Little Ranger brought his body home four years later for burial at Sunset Lawn Cemetery. She still prefers to remember the good times with The Railroad Santa and has kept all the precious clippings in a scrap book. Shirley (Ross) Hughey lived on South Gordy in those carefree school years. Her folks lived in a trailer house at the Althouse trailer court on the west side behind the motel on Kansas Avenue. Shirley smiled as she recalled, “Kids from blocks around came to watch the train go by but mainly to try and catch some candy or gum the engineer would throw to us. One time my little fox terrier, Chi Chi, ran out with us and was run over and killed by the train right before my eyes. For a long time I hated trains.” Shirley also said her brothers would climb up a water tower on the east side of the tracks near their home but she never did because she was afraid she would fall. South along the route to Winfield The Little Ranger would stop briefly in Douglass. Phyllis Wakefield says her husband Brick’s favorite stories of his childhood includes his memories of the little train and how the hired hand on his folk’s farm referred to it as the Toonerville Trolly. The one trip he took, the “crew” took very good care of him and gave him a tour of the engine. The Little Ranger brought so much to the people of Butler County, the mail, increased business, handier transportation, easier freighting, friendships, excitement, happiness, sadness, and tragedy. But The Little Ranger has not vanished forever. The first motorcar on the route, the M.177, is being restored by the Southern California Scenic Railway Association, Inc. Here in El Dorado, another Little Ranger is riding the rails again on the new El Dorado and Einstein Railroad or The Double E as it is locally known by the builder, Burt Bowlus. The eight-inch miniature Little Ranger moves around the tracks in Bowlus’ basement, through oil fields, passing grazing cattle, and to the station just like the original hustled from Emporia through the Flint Hills to downtown El Dorado. Dotting the city landscape on the Double E is the Hotel El Dorado, and El Dorado Times, the local fire station, Graves Drugstore, and lots of railroad tracks. In railroad jargon, The Little Ranger is still Highballing On Its Way, but will El Dorado’s memories last another 50 years? Cocktails 5:30 p.m., Dinner 6 p.m., Program 7 p.m.
Entrees also include ice tea/coffee, salad, garlic bread, choice of potato or rice, vegetable, and dessert for $22.50 tax and tip included. Child dinners (spaghetti or fried chicken) for kids ages 4-10 available for $10.15 all inclusive. Service Awards, Lots of Door Prizes, and Exciting New SCSRA Activities to be announced! The Mechanical Department deeply regrets that Bryan Reese, who has been spearheading the M.177 restoration since late 1993, has decided to leave the project. His loss will be keenly felt, but life and restoration projects must go on, so Chris Rippy will assume the lead role until a new Project Manager can be found. Along the way, we will emphasize the recruitment of additional volunteers to assist Doug Stephens and John Gardner who have so faithfully supported Bryan's efforts in recent months. We have attempted to send a partial payment to the generator rebuilder to show good faith and to encourage him to provide an up-to-date estimate for the generator and exciter rebuilding. With this information in hand, we would be able refine the project cost-to-complete and initiate renewed fund raising efforts. However, the unanticipated expenditure for crane services to remediate the jacking incident that Bryan mentioned in his last edition of DOODLEBUG NOTES, and the need to begin repayment of the principal amounts of several loans that Bryan negotiated to enable return of the Winton engine from the rebuilder, have prevented the CFO from accommodating this request thus far. The "jacking incident" deserves some elaboration. Bryan, in his written rationale, mentioned that the Museum is sitting on what he called "uncertified fill." The term "uncertified fill" is misleading since such a term is not commonly used in engineering, though it could be construed to mean "fill certified by a geotechnical engineer to have been compacted to a certain relative density per specification." "Uncompacted fill" may have been what Bryan meant. In any event, given that the front of the M.177, bereft of the power truck, weighs about 60,000 pounds, each of two jacks would be required to lift 30,000 pounds, and each jack stand would be required to support the same amount. The "footprint" of the failed cribbing under the jack stand on the south side of the car (which settled, accounting for the mishap) was about 4 square feet, which yielded a load on the soil of about 7,500 PSF (pounds per square foot). The maximum bearing capacity of uncompacted fill is generally considered to be about 1000 PSF. Even the bearing capacity of 90% compacted fill is only about 2000 PSF. Thus, it is obvious that the weight should have been distributed over a much larger area. The fact that the failed cribbing under the jack stand on the south side of the car sank only several inches under a portion of the 30,000 pound load being shifted to it speaks quite well for the soil. This was an "incident" that need not have happened, and represents a loss of nearly $3,000 from the Association treasury. The M.177 has been the Association's principal project since it began work at the Travel Town Museum, and its completion, without wasting money, must be our first priority. I have every expectation that Chris will rise to the occasion and assist in finding a capable replacement for Bryan. Diesel Shop — The No. 1 diesel engine of CS&CV No. 1 was removed several years ago for rebuilding. Chris Rippy has ascertained that the rebuild effort is complete except for the engine head, and he will get it moving again since the No. 2 engine in the loco has an ever-worsening lube oil leak that will require immediate attention once the No. 1 engine is reinstalled. The exhaust stack of the CWR No. 56 was discovered uncovered on March 17, and, as the loco had not been used in the interim, one can only assume that when it was last used on December 30, despite being blue flagged, to move the flat car trucks, the stack cover was apparently not replaced. Chris Rippy and Gordon Bachlund examined the loco and found that significant rainwater from the intervening weeks had accumulated within the exhaust system. After some deliberation, we decided to start the engine and let it idle until it reached a temperature that would drive out any remaining moisture. We did this, and are pleased to report that there was no apparent permanent damage to either the engine or turbocharger. However, so much soot was liberated with the several minutes of water spray that emanated from the stack that the loco will require a thorough exterior washing. From the World of Steam — The only activity to report is the movement of the steam locomotives that were east of the pedestrian crossing on Track 7 to the west to clear Track 7 for rebuilding. This movement was made by City forces and the Mechanical Department was neither informed (and afforded the opportunity to do spot lubrication beforehand) nor involved in the move. Regrettably, several wheels apparently slid during this movement. Battery Servicing — The caboose batteries continue to exhibit signs that they are nearing the end of their useful life. We will maintain them, provide equalizing charges, and get the most we can out of them, but inevitably they will shortly require replacement. That they were designed for a five-year life, and have lasted well over ten years, validates our battery maintenance program. Over the last few months the M/W department has done no work due to the city ban of track work. The only two things that happened that could be related to the M/W department is the change of leadership and some preliminary clean up work for the realignment of track 3. These four people make up the newly formed M of W Committee. Jeff Barrow was placed as acting M of W superintendent as to comply with Linda Barth's request of having one leader in charge. To elaborate on the preliminary clean up work for the realignment of track 3, the M of W committee assisted the motor pool superintendent, Timothy Riley, in relocating the 6x6 as well as the dump truck. Daniel Price and Jeffrey Barrow also were present while Sharp and Fellows were doing the reconstruction of the lead track. We disconnected the bond wires and the power feed to the wigwag before they began work as well as attempted to move the track liner but found that the battery was dead beyond any charge that we could give it. Other than that, the M/W department over the last few months has started no track projects. This was another difficult quarter for work. Lots of rainy days and vacation made it difficult to complete Motor Pool tasks. Even with the unplanned business and weather of this quarter, some items were addressed for Motor Pool. The 6X6 was successfully started and moved this quarter. An air leak was discovered and repaired with the help of Chris Rippy. Jim Fontenot showed me information regarding the headlights. Thanks to his help, this important safety issue is operating. All Motor Pool equipment has been started and is at least partially operational. I was approached later in the quarter to move the 6X6 and the dump truck to the south side of Track 3 for its realignment. With help of Jeff Barrow and Daniel Price, this move was made successfully. There a minor fuel leak was discovered and fixed during the warm up period for the dump truck on the day of the move. Besides that, the movement of these vehicles went smooth without any major problems or safety glitches. I noted that the batteries in the 6X6 are trying to hold charge; they may be in better shape than previously thought. I will try to complete a battery test to discover the battery conditions and if everything is okay, then I will hold them back for other Motor Pool equipment such as the fork lift or compressor trailer. The forklift had some minor battery flukes this quarter. There were several Friday Nights/Saturday mornings when I discovered that the lights were left on and the battery was dead. Up to this point, the battery has held a charge. If this continues to happen, the battery will not be able to hold a charge, which means that it will need to be replaced. I would like to take this time to encourage all Associates and City Employees to insure that the lights are turned off and the ignition switch is in the off position whenever this important piece of equipment is used. A big thank you to all associates who assisted me with Motor Pool this quarter. I have been very busy with productions in my theater (happens a lot this time of year) and so my report must be rather short. Andy Evans has come up with an idea for a public handout for operating days that provides a description of training provided and encourages interested folks to join. I will be reviewing this shortly and will reprint it in a future issue of The Headlight. Andy has also developed a simplified Airbrake instruction manual for our brakeman trainees. It too is in the editing stage. Thanks, Andy! 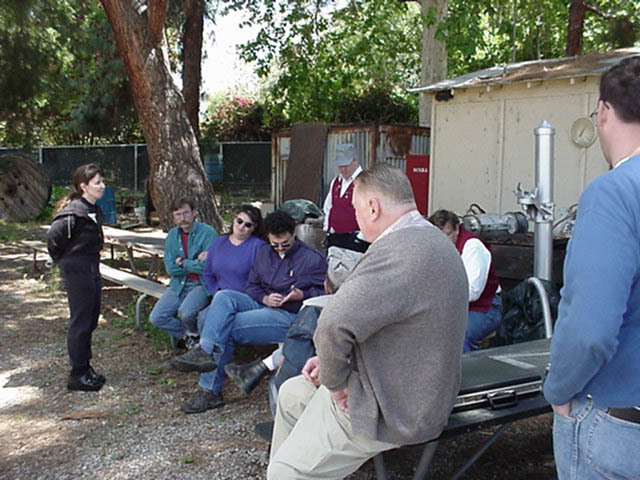 From Chief Instructor’s Desk — Gordon Bachlund reports that qualifications included Jeff Barrow (Hostler), Tim Riley (Train Service Engineer), Dug Ward (Brakeman), Don Schuster (Brakeman), and three Assistant Brakeman Instructors, Dan Price, Jeff Barrow, and Tim Riley. Congratulations! Our public operations were held January 6th and 7th, February 3rd and 4th, and March 3rd and 4th. Docents — Alex Alcantar, Bill Dale, Christian Galvan, Greg Hulett, Sue Kientz, Daniel Lee, Sean McDyer, Eric Recchia, Cesar Rivera, Annette Sevigny, Ed Temm, Chris Williamson. Operators — Jeff Barrow, Andy Evans, Mike Flaharty, Nancy Gneier, Charity Lawrence, Dan Price, Greg Ramsey, Yvonne Ramsey, Tim Riley, Chris Rippy, Don Schuster, Darlene Sexton, Mike Vitale, Dug Ward, Alan Weeks.